Step Up’s long lost great has returned to Cape Town and will be destroying the floor with some fresh tunes on wax straight outta London Town. For any of you who don’t already know Danja, one of DnB’s pioneers in Cape Town, now you will have the chance to witness his skills. He will be playing his first much anticipated dubstep set. dj low has been pumping dancefloors for a good few years now. His little dubstep teaser at 300 AD was enough to get anyone in hearing range excited, so check him out! Ofcourse you all know Ish our step up resident, after a month break she will be back with some new wax ready to mash up the floor. 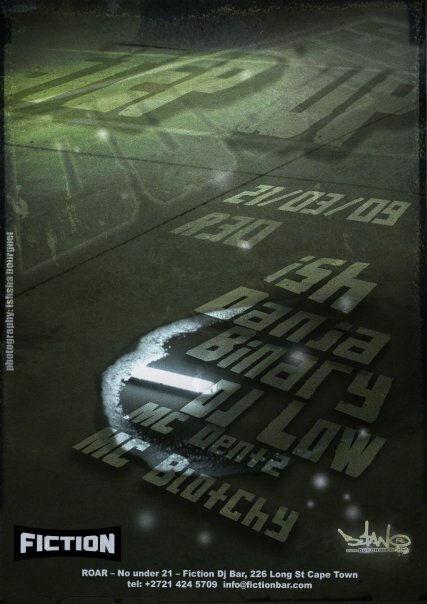 MC DENTZ – hailing from the UK massive Dentz will be hosting the night alongside MCBLOTCHY WORKER BOY. As always Butan Prizes and give aways. gonna be such a vibe!! !